Just because winter is coming, that doesn’t mean it is time to forget about your air conditioning system. By properly maintaining your AC system throughout the winter, you will ensure that it will be ready to work smoothly and properly once the warm weather sets in again. Here are six air conditioning maintenance tips for the winter. During the autumn, clean the outdoor unit thoroughly. It is the perfect time to take it apart (carefully, of course) and clean out any leaves, twigs, grime, dirt, and debris that got caught in it during the summer. During the winter, cover your outdoor air conditioning units. This will prevent them from getting damaged by snow, ice, and hail. It will also prevent them from getting dirty again by falling leaves and twigs. Make sure the covers are securely fastened. Throughout the winter, inspect the outdoor units on a regular basis. Clean off any buildups of snow and ice on top. Make sure there are at least a couple of feet of clear space surrounding the units. Flip the circuit and turn off the breaker to your unit. This way, if there is an Indian Summer (an abnormally warm day in the middle of the winter), the compressor won’t turn on by mistake. 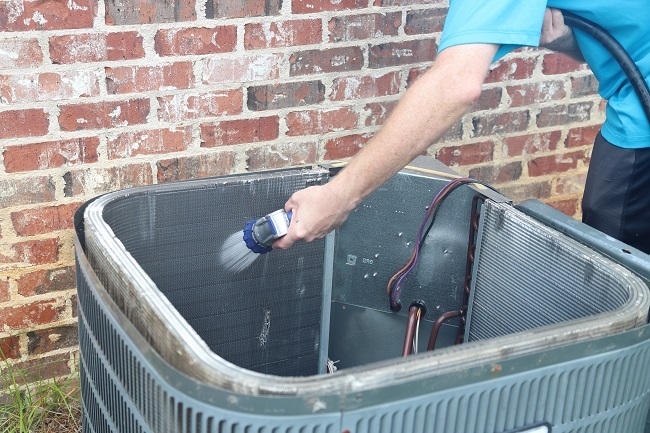 Make sure that the coolant lines connecting your unit to your home are properly insulated and that they are not cracked, frayed, or peeling off. Have them repaired or replaced if necessary. Having a regular service plan so that your HVAC system gets checked regularly by a professional is super important. It will help you detect problems early on so that you save money in the long run and stay comfortable all year round. Contact us today for more information.